Smooth Muscle Actin antibody LS-B7351 is an unconjugated mouse monoclonal antibody to human Smooth Muscle Actin (ACTA2). Validated for IHC. Tested on 20 paraffin-embedded human tissues. Recognizes human Actin, Smooth Muscle. Staining pattern: Cytoplasmic. 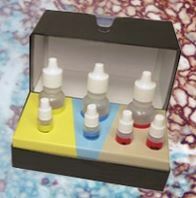 Suitable for use in Immunohistochemistry. Immunohistochemistry (Paraffin, frozen): 1:10-1:50. 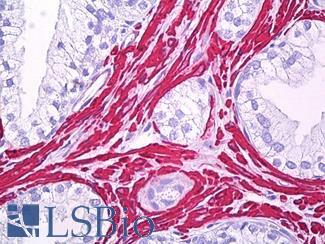 Anti-Smooth Muscle Actin antibody IHC of human prostate, smooth muscle. Immunohistochemistry of formalin-fixed, paraffin-embedded tissue after heat-induced antigen retrieval. Antibody dilution 1:50.